In January 2005, Erwin Van Lun launched his first book Van Massamerk naar Mensmerk and related book-blog http://www.mensmerk.nl. The book described the next ten years in media, marketing and brands while his weblog focused on daily changes of media, marketing and brands, step-by-step unfolding of his predictions of the future. 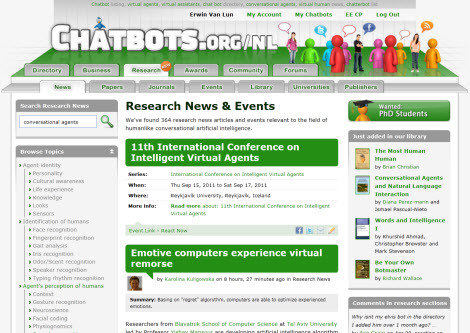 As the rise of brand agents was a key element of his vision (and still is), as described in his book, and a lot of new (MSN Messenger) chatbots were launched in 2005, examples of ancient brand agents, he decided to create a separate page on his website: www.mensmerk.nl/chatbots.html, a listing of all chatbots in the Netherlands and a selection of chatbots worldwide. Soon, this page became the most popular page of his site. 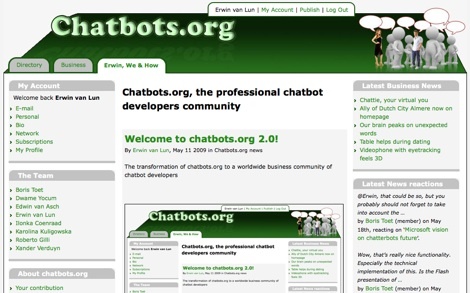 On April 10th, 2006, he registered the domain name ‘Chatbots.org’ which appears to be available at that time. 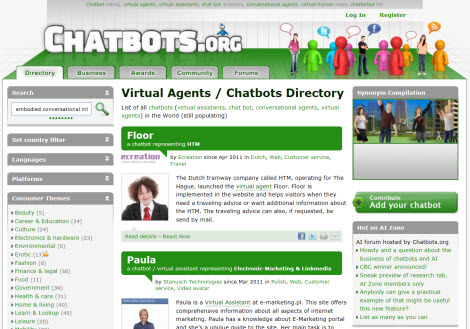 When he defined his futurist and professional speaker strategy back in 2007, he decided that these chatbot pages wouldn’t fit into the new version of Mensmerk.nl and its English equivalent (www.erwinvanlun.com). Therefore, after the launch of his new websites in September 2007, these pages weren’t part of the website navigation anymore, however still available via search engines and still ranked very high. This made him think and he started to work on a new concept: Chatbots.org. Erwin continued to work on Chatbots.org where he did all technical modifications by himself. Just as a kind of hobby. 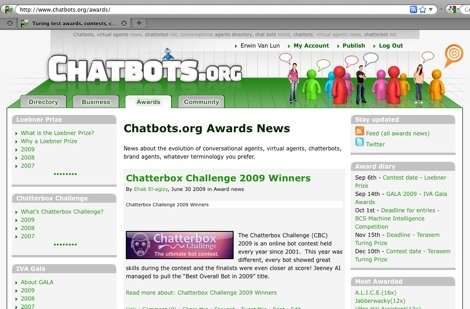 Chatbots.org 1.0 had its soft launch in January 2008. Edwin van Asch assisted Erwin during these days and jointly they had entered 100 chatbots on March 30th, 2008. Chatbots.org was finally launched in April that year. On May 3rd, 2008, it obtained a Google Page Rank of 3 and on May 21th, 2008 it obtained Page Rank 4. Version 2.0 was launched May 11th, 2009. All functionalities were developed keeping Chatbots.org’s new mission in mind: “To be the leading community of chatbot developers, academics and users focusing on research, technology and innovation to drive success for all participants.”. Within this version, business news and community information tabs were introduced. Furthermore, it allowed people to register on the site and to build public profiles. It was also the introduction of the first version of the pseudo 3D header. On June 4th, Chatbots.org obtained Google page rank 5. Version 2.5 was launched August 17th 2009. It featured all chatbots and/ or related AI awards, a special ‘feature profiles’ section highlighting everyone who has willingly shared their AI knowledge and a brand new design of the Chatbots.org header. From a design point of view it included an animated favicon and cute Twitter animation. On top, the speed of the website was considerably increased. 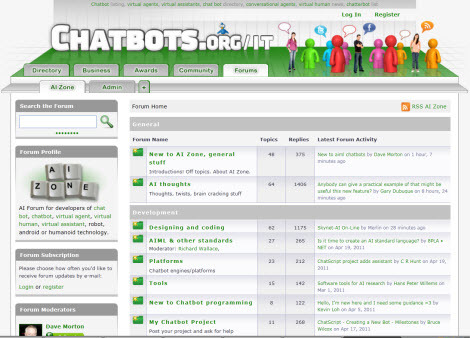 On March 16, 2010 we launched version 2.6 which contained our very first forum, originally linked the Robitron Mailing List and later renamed in AI Zone, a forum for enthusiastic chatbot developers. Furthermore, the design of the website was more in line with the header that was introduced in version 2.5. Although version 2.6.5, as introduced on October 18, 2010, was a minor upgrade from a visitors’ perspective, it was a huge internal adjustment: The site was migrated from Expression Engine 1.6.9 to version 2.1. We took the opportunity to redesign the directory area which led to a phenomenal speed increase, introduced more convenient chatbot selection tools in the navigation and allowed us to introduce the Chatbot Information Management module with a smooth workflow for professional chatbot developers. The redesign of the directory area also prepared us all for a localization of our pages. Other tools introduced in our back office were the AutoLink module that automatically creates hyperlinksto our synonym pages from other content areas, and the LinkManager to detect and repair bad links anywhere on our website. 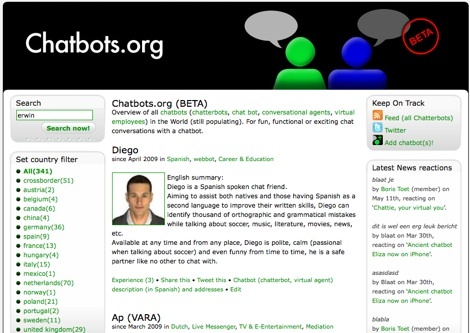 Version 2.7 launched on April 22, 2011 was the result of one of the largest projects of Chatbots.org until then, known as: The Research Project. We worked on this project for over 18 months, in particular on the content. This resulted in a total new section focused on academic research with 1,031 academic journals, 165 books, 327 academic events, 475 publishers and loads of academic papers. Additionally, it introduced a new reputation ranking system for universities and marked the beginning of the facilitating of the academic community working on humanlike conversational AI. Version 2.8 has been the largest addition to our business area since its introduction in February 2009. 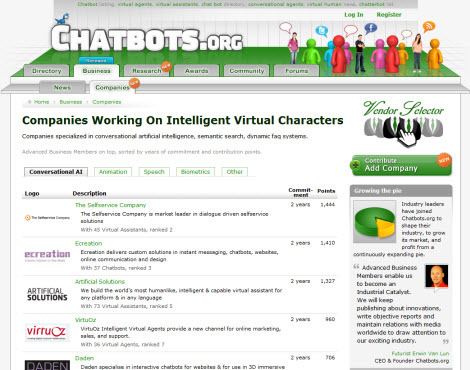 Launched on October 12, 2011, it contained an extensive overview of companies active in the Intelligent Virtual Character field. With 275 companies specialized in conversational AI, animation, speech technology, in (visual) biometrics and related areas, it turned out to be the most comprehensive business directory in our field. The first version of the vendor selector, a tool for corporate buyers to select vendors specialized in this field was also introduced as part of version 2.8. This version offered industry leaders to participate in our prestigious advanced business membership program. Companies could gain enhanced visibility, a high conversion profile and lead reporting through online reporting called ‘analytics’. The idea of business participation was a key objective in the initial strategy of Chatbots.org, but the concept of having a membership was first introduced during Erwin’s road trip in the UK in September 2009. Back then, he met UK developers face-to-face for the first time and noticed an interest for this program. It took a while to introduce this program, but it came into fruition in the end.